“The only thing constant in life is change” is a familiar expression, and change is something municipal leaders face on a regular basis. This issue, we give readers a preview of what they have to look forward to during our 14th Annual Convention taking place from November 26-29 at the Winnipeg Convention Centre. 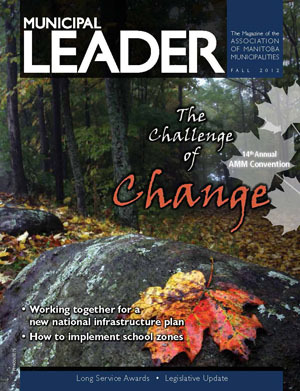 The theme, fittingly, is “The Challenge of Change” and it explores the growing pressures on municipalities to provide more with less. How do local governments create positive change – and respond to the needs of their citizens – during times of fiscal restraint? One way to accomplish this is to ensure future funding programs meet the needs of municipalities. We’ll tell you how all orders of government are working together to create a new national infrastructure plan, and how the AMM is making sure our members have made their voices heard throughout the process. The City of Winnipeg also has had plenty of success using a P3 model on a number of important projects, helping them stay on time and on budget. That story, by Mayor Sam Katz, is our “Municipal Idea” this issue.